Hi there! This is Natalie from Let’s Get Together and we are so excited to be guest posting here at Little LDS Ideas. Sheena is super talented, and we love the fun ideas and beautiful things she shares here. I blog with my sisters and my mom-so I guess you could say we’re a family blog in every sense. We blog as a family and for families, because we really believe that in the big things and little things, life is simply better together. At Let’s Get Together you’ll find our favorites around everything from holidays to Family Home Evenings and everything in between. We’ve all been there. You’re out running errands for the afternoon or you’re in the middle of making dinner and you get the call that whatever you were expecting to happen that evening for the youth activity-isn’t going to happen. Even the best of planners have an activity that falls through at the last minute. And we’re here to help with 5 last-minute ideas… that aren’t basketball. What You’ll Need: some pre-made pudding, some cookie sheets and hands ready to get messy! This is super simple but super fun. Just like normal pictionary one person in each group will be drawing a picture for the others to guess. 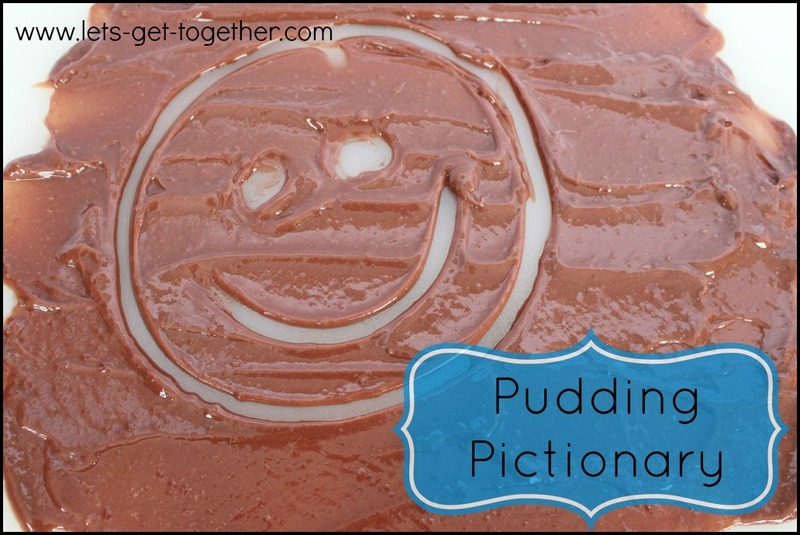 The catch – it will be drawn in pudding! So make some pudding in advance for the activity. Split into two or more groups and have one person from each team go at a time. Put some pudding on the back of a cookie sheet for each person. Then they can pick ideas out of a hat or it can be done by theme (we have draw-able scripture themed list that’s ready-to-print right here at the original post). The individuals from each team up to draw will be drawing the same thing and the first team to guess gets the point. It might be wise to have some paper towels near by to wipe hands off! 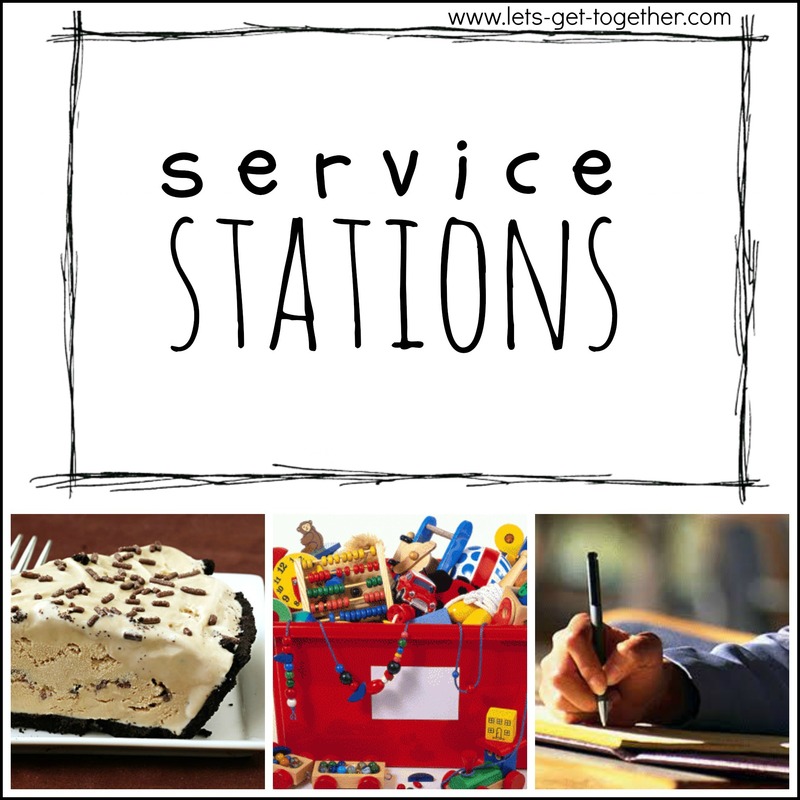 Set up three different stations where the youth can do simple service. Split them up into three groups, set a timer for 15-20 minutes, and rotate them through. 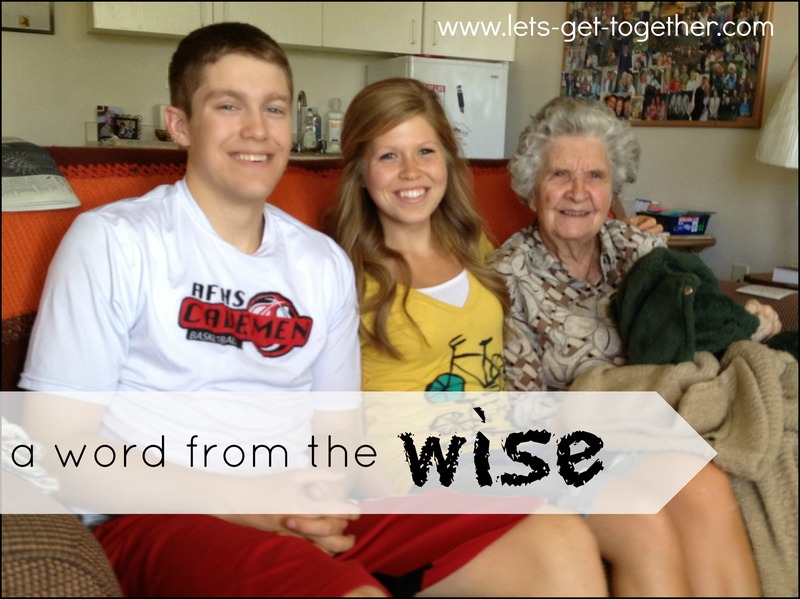 Write to missionaries from the ward. 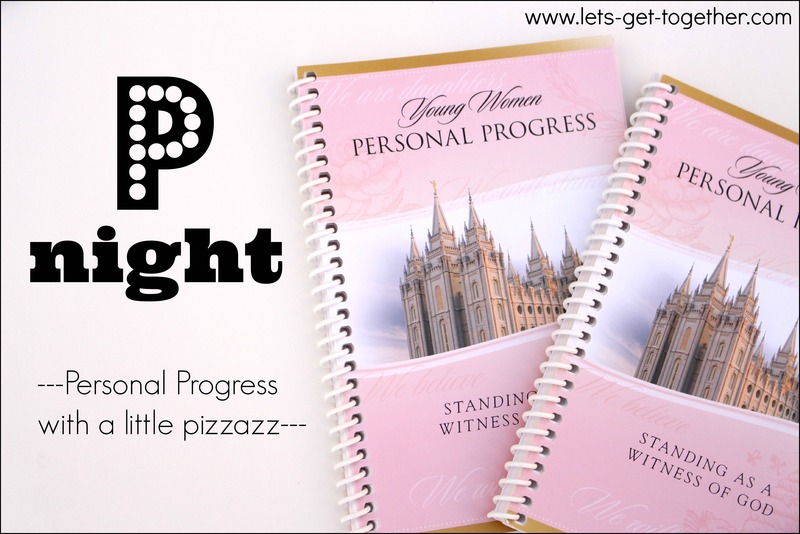 What you’ll need: Bring your Personal Progress books, wear your (completely appropriate) pajamas, and chow down on pizza, pretzels, peaches, popcorn, or whatever other “P” food strikes your fancy! Get comfy and get working! 4. 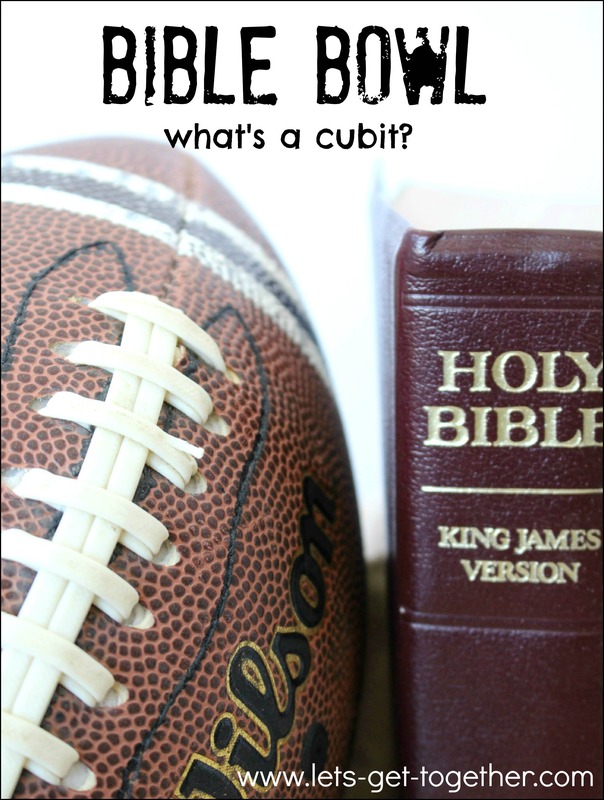 Bible Bowl Here’s what you’ll need: poster board, white board, or a chalk board; markers or chalk to draw a football field ; brown card stock or construction paper to make a 3 inch football; masking tape to use on the back of the football; Bible Bowl Questions and answers printed out How to Play: 1. Divide your group into 2 teams and name them. 2. Decide how long the game will go and set a timer. 3. One person should be the referee (ask questions and verify answers). Toss a coin to determine which team goes first. 4. Put the ball on the 50 yard line and ask the first question. You can find 70 ready-to-print questions and answers here at the original post! 5. If the first team can answer correctly they gain 10 yards and continue answering questions and moving 10 yards. If they cannot, then the next team gets the ball from that position. They get to answer a new question and move 10 yards for each correct one. 6. When a team scores a touchdown they get 6 points and the ball goes back to the 50 yard line and the opposing team gets to answer questions. 7. The game ends when the time is up and you add up the points. Who’s the champ? There is wisdom just waiting to be had-and it’s probably around the corner. This activity is great for the youth and fantastic for the people who are visited and interviewed. Make a list of people to visit, call ahead to see if they’ll be available and willing, and break the youth up into as many groups as you have people to visit. We’ve come up with a list of questions that you can distribute to the groups to get the question asking juices flowing. It might be neat to meet back up after the visits and give the youth a chance to share some of the stories the heard and things they learned. Where were you born? What was your family like? What is your fondest memory as a child? What hobbies or interests do you have? What subject did you like or dislike in school? How are you like your mother or father? What was your first job? How did you meet your spouse? Where was your favorite place that you lived? What was the most important thing you taught your children? What do you hope people will remember about you? What makes you laugh? What challenge did you have growing up? What is your favorite book and why? What is the most amazing thing you have seen in your life? What did you dream of doing when you were younger? What are you most proud of? If you could change one thing, what would it be? What makes you happy? Who would you like to have dinner with? 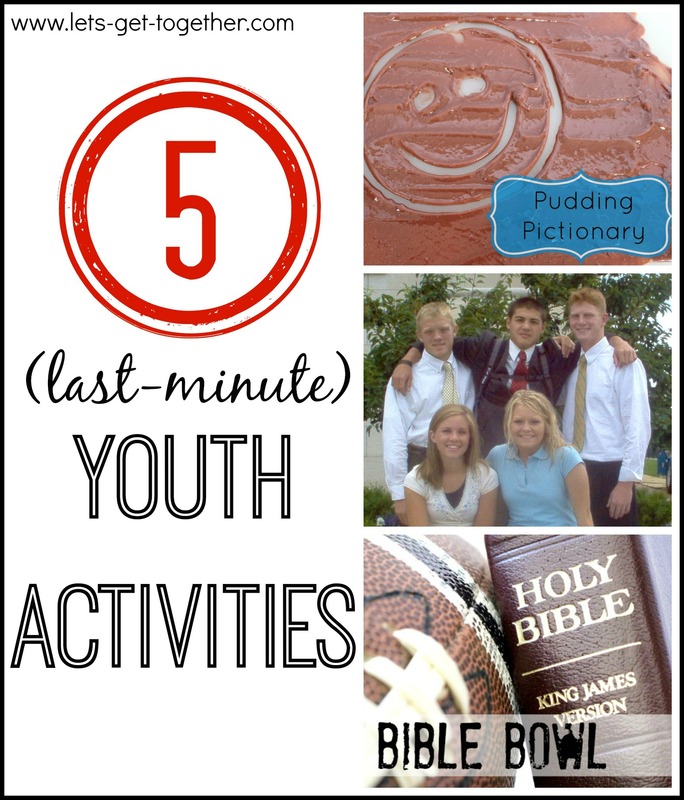 We hope you’ve enjoyed this round-up of last-minute youth activities. May your Wednesday nights (or whichever night you meet!) be fun, fulfilling, and not always basketball. Be sure to visit Natalie and her Mom and Sisters over at Let’s Get Together. They have some great ideas on their blog that you will absolutely love. For anyone in charge of Girls Camp….they have posted some great ‘Frozen’ ideas on their blog, so hurry up and get on over there and check it out!